This page in a nutshell: Racists are inherently incompatible with Wikipedia. They will almost inevitably lack a neutral point of view and be a POV-pusher. If you think you've spotted one, see if you can find a number of supporting diffs and if so, report them straight to the incident noticeboard. Also report racist imagery on user pages on sight. It is a common perception—based on our claim of being the encyclopedia anyone can edit—that Wikipedia welcomes all editors. There is also a misconception that because maintaining a neutral point of view is one of Wikipedia's five fundamental principles, administrators would be acting contrary to this if they blocked a racist upon learning of their public self-identification. Because of this, many neo-nazis, neo-fascists, white supremacists, white nationalists, identitarians, and others with somewhat-less-than-complimentary views on other races* (hereafter referred to collectively as "racists") believe they are welcome to edit Wikipedia, or that they can use Wikipedia as a propaganda tool, so long as they stick to the letter of our policies. This is not true. 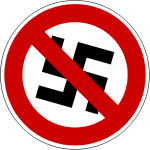 Racists are not only unwelcome here on WP, they are usually indefinitely blocked on sight if they express their racist ideas on-wiki. This includes non-white groups, such as black supremacists, though such groups are extremely rare in the English-speaking world. That white people are more intelligent than non-whites. That white people are more industrious than non-whites. That white people are more physically adept or attractive than non-whites. That white people are morally and ethically superior to non-whites. That the various cultures of white people are better than the cultures of non-white people. That white people have the right to live in a white-only nation. That most—or at least a large majority—of crimes are committed by non-whites. That there exists a massive Jewish conspiracy to enrich Jews at the expense of other races. That white people are being systemically killed, outbred and otherwise forced into a minority status. That the Holocaust never happened, or historians have inflated the death toll. That non-whites hold back white progress. That non-whites intend to kill whites. That white people are more oppressed than other groups. That groups of people should be wiped off the face of the planet, or systematically repatriated to the lands or continents they supposedly originated from. That Jewish people are responsible for the creation of Communism. That Adolf Hitler was a great leader for the German people, despite (or because of) Nazi Germany's innumerable atrocities. That the concept of free speech entails freedom to post race, gender, or identity-based slurs, insults, or promotion and glorification of violence, without any consequence whatsoever, and that any consequence brought upon them is an act of censorship. These beliefs are—without exception—either demonstrably false, completely unsupported by evidence or just impossible to prove. The very existence of a "white race" is a pseudoscientific idea that has been rejected by the scientific community since the late 1960's - shortly after the discovery of genetics. See Race (human categorization)#Modern scholarship for more on this. Debunking these beliefs is not the purpose of this essay, so they are not addressed here. Suffice it to say that all of these beliefs are considered false or meaningless by experts in the relevant fields. One can verify this with any sufficiently in-depth encyclopedia. There happens to be one close at hand. The problem with editors who hold racist beliefs is that they usually interpret nominally clear information that pertains to those beliefs in a drastically different manner than an objective reader would. This leads to the frequent introduction of errors. It also results in racist editors taking wildly different stances on the weight of certain experts and sources who digress from the accepted consensus in their profession. For example, the consensus of neurologists and research psychologists is that there is no meaningful correlation between race and intelligence, yet a small number of experts continue to do work in that field, and even to publish said work. While this work is occasionally quite well done (though instances of poor methodology seem more frequent than with mainstream scholarship), it nonetheless represents a fringe view within the field. Racist editors will almost inevitably attempt to add those views to articles about the subject, and will almost always present them with greater or equal weight to the mainstream view. This means that racist editors almost inevitably run afoul of our policies on original research, verifiability and the neutral point of view. Another problem with racist beliefs is that they immediately alienate any non-racist. As soon as a good-faith editor begins to suspect another editor of harboring these beliefs, it becomes all but impossible for them to work together without conflict. Without fail, non-racists find racist beliefs to be abhorrent. They fly in the face of the basic decency shared by most non-racists, and even though a racist editor may perceive themselves to be moral and objective, to all non-racists this is obviously and horribly untrue. The racists of early 20th century Germany set out to build up their nation, to improve the future abilities of all of humanity, and to protect their people from perceived threats. All of those are intentions which, in most contexts, would be highly moral, even laudable. But in the context of racist beliefs, they resulted in possibly the most evil regime to ever exist. It is important to note that Nazism presents a special case, owing to the holocaust. Even if one is a "nice" Nazi who doesn't really believe non-Aryans should be exterminated, or even if one is just "playing around" with Nazi slogans, imagery or ideas, the moment an editor identifies as a Nazi in any way, they are endorsing the Holocaust in the eyes of the vast majority of other editors. Owing to their racist beliefs, far-right trolls often organize edit campaigns on various anonymous channels, believing that they could seize Wikipedia with their racist, or fascist propaganda. Such users by nature do not come in good faith, and they will inevitaby utilize various civil POV pushing techniques under the remote semblance of civility. This includes, but is not limited to, inserting fringe views from questionable sources, and trying to frustrate and drive away other editors in pages and pages of endless sea-lioning debates. This is a ever-present threat to this project, as it undermines the reliability and the collegial editing environment that gave rise to Wikipedia's reliability. For the healthy longevity of this project, Wikipedia must strive to be free from such disruptions. Racist ideology is inherently incompatible with Wikipedia and use or display of its symbols and iconography on the project is disruptive. The English Wikipedia and the Wikimedia movement as a whole are based on the concept that everyone has a right to receive free knowledge, regardless of their race, ethnicity, class, creed, or any other demographic factor, and that everyone has the right to contribute to this sharing of knowledge so long as they act in a way that does not disrupt the ability of others to contribute. Racism, both historical and neo-racist varieties, is inherently incompatible with these principles in a way that virtually no other ideology is. This is particularly true of neo-Nazis and other groups with ties to genocidal ideologies. Disruption by racists, while often taking place in articles and talk pages, often comes to a flashpoint in user space, when a user openly displays iconography from racist groups on their user page or signature. The only way for administrators to recognize this form of disruption is if these individuals make it known on Wikipedia. Declaring oneself to be a racist or using Wikipedia as a webhost to show racist or nazi imagery and propaganda or mythologizing crosses the line into disruptive editing because it is telling a significant portion of our readers and editors that they shouldn't exist. This is contrary to the principles in the policy on personal attacks and Wikipedia's five pillars. That isn't acceptable, and we block for it. This is sometimes interpreted as censorship. It is not censorship. As a private website, Wikipedia and its community has the right to determine that some actions cross a line that make it impossible to contribute in a collaborative environment, and when that line has been crossed, the person is no longer welcome. Additionally, editors who come here to push this fringe point of view in articles, under the guise of the neutral point of view policy are typically blocked as POV pushers. Racist trolls and vandals are a serious threat to the encyclopedia. They make people feel unsafe and they harm our credibility with the world if they are allowed to continue to edit. They should be blocked once they make themselves clear. Administrators take claims of racist vandalism and trolling very seriously, and will usually act swiftly if the claims are justified. Claims of racist trolling and vandalism should not, however, be used as a trump card in disputes over content or at a noticeboard. These claims can have a chilling effect and make the normal dispute resolution process difficult to go through. This is especially true if the editor who is being accused of racism has their real world identity publicly tied to their Wikipedia account. Unsubstantiated claims of racist vandalism and use of unsubstantiated claims to gain an upper hand in a content dispute or noticeboard thread is disruptive and a form of personal attack and will often lead to the user making it being blocked. Claims of racism should not be made lightly and editors should strive to work through the normal dispute resolution process when it comes to legitimate disagreements on interpretation and quality of sources and other content disputes rather than clear racist disruption. If you encounter someone you suspect to be a racist, the first thing to do is to stop and take a deep breath. Odds are, that person is not a racist, but rather either an editor who happens to share a perspective (not even necessarily a belief) with racists, or an editor who has made you mad and who said something that might be considered racist if you squint at it and turn your head just right. Wikipedia is not censored, and the odds are that the person you disagree with is a good faith editor with a different perspective than you. So getting a little distance can help make that clear to you. If, after taking a second look, you still suspect this editor to be a racist, check their contributions. Racists on WP inevitably come here to try to push their ideology, so if they really are a racist, you should see lots of edits to pages associated with racist beliefs. Their edits at those pages, furthermore, should always or almost always push a right-wing, fascist, racist or antisemitic view. If that's the case, then gather up some of those diffs and head off to the administrator's incident noticeboard. If, however, you don't find a history of pushing racist ideologies in their edits, then accept (provisionally, at least) that you were wrong about them being a racist and move on. It is important to note that simply because Wikipedia does not tolerate racists does not mean that the admins will block anyone accused of being a racist. Calling another editor a racist is a serious charge (even worse than calling them a POV pusher), and if the evidence is not there, you can expect to be blocked for making personal attacks. So don't make such an accusation lightly. If an editor is displaying racist imagery on their user page: don't bother verifying. Report it to ANI (as a user displaying racist imagery, not as an racist editor) right away, because that is not acceptable, and there is no room for interpretation there. Ward, Justin (12 March 2018). "Wikipedia wars: inside the fight against far-right editors, vandals and sock puppets". Southern Poverty Law Center. Archived from the original on 2019-02-27. Retrieved 2019-02-27. This page was last edited on 27 March 2019, at 08:05 (UTC).